The more they ran and the more they won, the more the pressure continued to mount. So when the North Hunterdon girls and Abby Loveys of Randolph have steamrolled their way through every course and every opponent this entire fall, toed the line at Saturday's 47th NJSIAA Meet of Champions, they did so with huge expectations. And just like they've done all season, North Hunterdon and Loveys rose to the occasion, this time when the stakes were highest as they proved why they are the best in the state with convincing victories at Holmdel Park. North Hunterdon, ranked No. 1 in New Jersey since winning the M of C title last year, captured its second straight title, 93-125 over runner-up and NJ #2 Ridgewood. Holmdel finished third with 136 points, it's highest finish ever. The M of C title is the eighth for North Hunterdon, the second most in state history behind Red Bank Catholic's nine, and it gives the Skyland Conference nine M of C girls titles in the past 12 years. Meanwhile, Loveys left no doubt that she's the top runner in New Jersey with a dominant performance as she kept her undefeated rolling along. Loveys blasted out to a big early lead on her way to victory in 17:54. Junior Chloe Gonzalez of North Hunterdon was second in 18:09, and senior Alexa Westley of Warren Hills was third in 18:13. 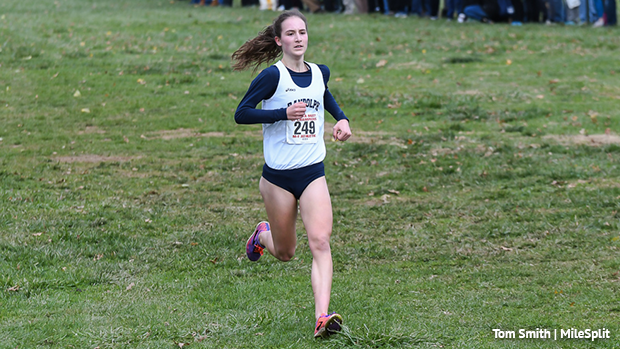 Nicole Vanasse of Pingry, the Non-Public A state champion who was third last year, dropped out near the two mile mark due to illness. She has been sick for most of this past week. Loveys, a senior, did what she's done all season by racing out to a big early lead and daring someone to try to catch her. As usual, no one could as she ran unchallenged the rest of the way on the way to her first XC M of C title and the second M of C title of her career. She won the 1,600 at the M of C last spring. Loveys had a six second lead after the first half mile, led by 10 seconds when she hit the mile in 5:54, had a 14 second advantage coming out of the bowl, and opened a 17-second gap at two miles, which she went by in 11:58. Loveys, 12th as a freshman and sophomore and seventh last year at the XC M of C, said winning this title has always been a dream of hers. "Ever since I came here as a freshman (when Alyssa Aldridge of Mainland won in 2015), winning the Meet of Champions in cross-country has been a huge goal of mine,'' said Loveys, who won the Group 4 race last week in 17:52, No. 11 in Holmdel Park history. Loveys said it means a lot to her to become the first runner from her school to capture an M of C XC crown. Loveys said that while she was hoping to run faster than she did last week, the primary goal was to run for the win. "I was hoping to go faster than last week, and that's why I went out faster, but as the race progressed I was just focusing on maintaining a good pace and keeping a good lead,'' said Loveys. As for having a target on her back all season, Loveys handled the pressure and mental aspect of racing just fine. In the team competition, North Hunterdon finished 1-4-25-28-35 and averaged 19:18 on the way to its 32-point win over Ridgewood. Gonzalez, second in a Holmdel PR of 18:09, and senior Emily Nugent, ninth in 18:52, led the way up front for the Lions, and senior Angela Kearsley also came up huge for North Hunterdon. Kearsley ran her best race of the season as she was the No. 3 runner for North Hunterdon and 42nd overall in 19:43. Last week, Kearsley ran 20:22 was the No. 6 runner for her team. North Hunterdon's other two scorers were sophomore Alexandra Carlson, 46th in 19:50, and freshman Addison Schmidt, 55th in 19:58. "We really don't think of the pressure and expectations that other people have for us,'' said Gonzalez, who will try to help lead North Hunterdon to its second straight Nike Northeast Regional title next Saturday. Nugent said adding to the legacy of greatness at North Hunterdon, which started when then coach Bob McGivney led North Hunterdon to six M of C titles in 1980s with the "Fast Ladies'', is a huge motivating factor for the Lions. "To come back here and win again has been such a big goal for us all season, and it feels great to add to the great tradition of the "Fast Ladies'' by winning this title for the eighth time ,'' said Nugent.